June 25th, 2009 - Windsor, CT - John Waiveris, Owner of Invisible Gold LLC Unveils "Tech Dog"
June 25th, 2009 - Windsor, CT - John Waiveris, Owner of Invisible Gold LLC Unveils "Tech Dog". Invisible Gold LLC, Hosting CT, and PC Development Group cosponsored a dog sculpture for the local "Paws For A Cause" fundraiser for the Windsor Education Foundation. 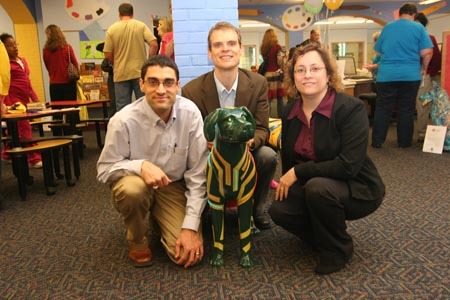 It was unveiled along with the other 27 dogs at a public art exhibition in the Windsor Library. Tech dog is now on display at PC Development Group. John designed, painted, and wired the dog. "Tech Dog" includes nearly 100 feet of "EL Wire" which glows and cycles through colors like a neon sign. "Paws for a Cause is a public art benefit for the Windsor Education Foundation. As a community wide event we encourage participation by all businesses, organizations and individuals. Paws for a Cause is transforming the town of Windsor into a playground with artist-decorated dogs. The fiberglass models celebrate the creativity of our local arts community, promote area businesses and raise funds for Windsor Education Foundation programs and grants." For more information about PC Development Group and to see the dog in person, visit www.pcdevelopmentgroup.com. For more information about John Waiveris and Invisible Gold, LLC, visit www.invisiblegold.com. For more information about Hosting CT, visit www.hostingct.com.